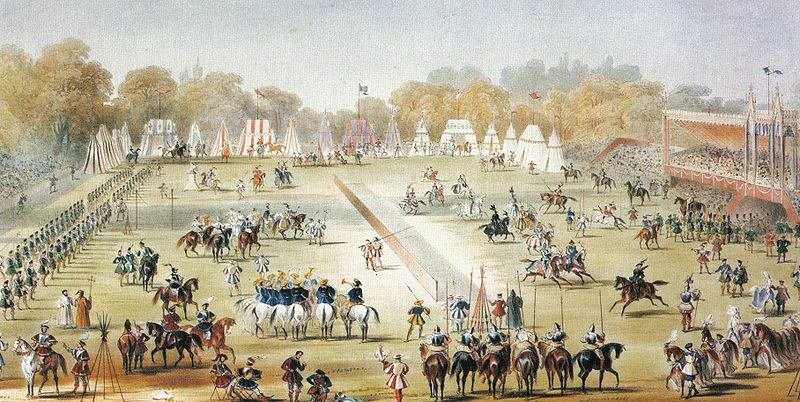 In 1839, after what some considered a meagre Coronation for Queen Victoria, one man, Archibald Montgomerie, 13th Earl of Eglinton, decided to stage a medieval style tournament to right this apparent wrong. Held at the Earl’s ancestral home, Eglinton Castle in Ayrshire, the tournament attracted over 100,000 visitors travelling from as far a field as America and Europe, and many dressed in the themed medieval costume. Unfortunately, what had promised to be a great event was literally a wash out; a torrential downpour that did not let up for the entire three days of the tournament caused the ground to turn into a quagmire. The jousting pavilion and the roofs of the stands collapsed, and the banqueting tents and ballrooms began to leak. Visitors who wanted to leave, some of whom had been sleeping in the open air due to the lack of available lodgings, had to walk through mud and rain to the local village after heavy flooding stopped any form of transport having access to the castle. 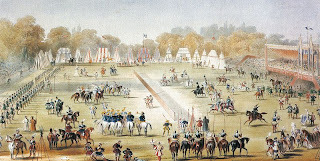 On the third day, with a smaller number of spectators and some hasty repairs, aspects of the tournament still managed to go ahead, but the damage had been done and the press had a field day. Although the event had not been the success it was hoped it would be, it captured the public’s imagination and was reported across the globe, shining a light on Scotland and making a hero of Lord Eglinton for his chivalrous attempts to help the stranded crowds. And for those who had been unable able to attend the actual event, adaptations of the tournament were staged in London theatres. Jug, William Ridgway, Son & Co, c.1840, white stoneware with relief moulded decoration. This jug was one of the many souvenirs of the tournament. Made by William Ridgway, Son & Co it is decorated with knights in armour similar to those that would have taken part in the tournament.